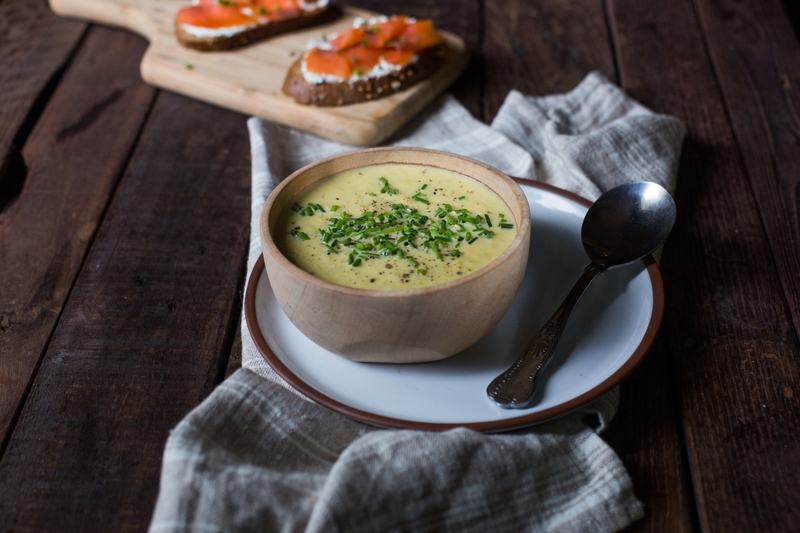 Leek soup needs no introduction. I pair mine with toast and smoked salmon, which elevates this humble meal to a substantial yet speedy supper. Heat the butter and olive oil in a large soup pot over a medium heat. Peel and roughly chop the leek, onion, potato, garlic and bacon. Add to the pot and cook for 10 minutes until starting to soften. Top up with vegetable stock. Bring to a simmer and cook for 25 minutes, or until the vegetables are cooked through and soft. Use a hand-held blender to blitz the soup until smooth. Allow to cool slightly before adding the cream. Mix well. Meanwhile, toast your bread. Spread the ricotta on your toast and top with smoked salmon. Divide the soup between four bowls. Sprinkled with freshly chopped chives and serve each bowl with a slice of smoked salmon on toast. Vegetable Bouillon: Dr Coy’s vegetable bouillon is an Irish made organic seasoning that you can use in your soups without having to worry about additives and excessive salt. Find out more on www.drcoys.ie.